Fighting to be Frugal: A Là Peanut Butter Sandwiches! A Là Peanut Butter Sandwiches! Does the line bring back memories to you of Mumford the Magician from Sesame Street? Who doesn't have memories of taking a peanut butter sandwich to school? It may not be as popular today in schools due to allergies, however, everyone loves peanut butter. It's just not as frugal of an option as it once was. In the fall there was news that peanut butter prices would be going up due to some natural disasters that limited the peanut crop. Yet, it never seemed to happen. The prices stayed hovering around $6.50/2kg of peanut butter, give or take, for several months. We were warned so that we would be able to stock up, however, by the prices not suddenly rising, we were lulled into a security that the prices never would. 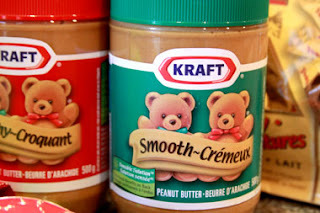 Kraft notified the public that there were expecting peanut butter prices to rise by 35% by January 2012. That would bring the price up to $8.76/2kg. In the past several months, I have noticed that the prices climbed and not rather slowly either. The end of January the price rose to $7.50/2kg. By the beginning of March $10.99/2kg! Shocking! That's a raise in prices of 69.4%! Thank heavens the rest of the food prices don't rise that dramatically in 4 months. We would all starve! Lawtons Drugs had 1kg on sale a couple of weeks ago for a one day sale $1.88! I am now grateful that I bought several containers! However, today while I was at Walmart, I noticed that they haven't increased their price yet. It's still $6.37/2kg! There were only a couple left, not on sale either, so we purchased them. I asked around and they are getting more in within the next couple of days and there hasn't been a notice that their price is increasing. So, if you use peanut butter for anything, stock up at Walmart over the next few days while the cost is still down. Or go to Sobeys next week (March 9-15) where Skippy peanut butter 2kg will be on sale for $7.99. And I'm guessing that the prices aren't going to go back down when the peanut stock regulates again. Flour hasn't yet. What have you stocked up on to make sure you beat the rising cost of food? I will have to look at Costco the next time I am there....mind you i'm stocked for right now....love getting deals! !